For millions of Americans, Thanksgiving means turkey, parades, family, and the road-trip to reach it all. While everyone’s final holiday destination is unique, there are many common stops along the way. Using data from Google Maps, we’re providing insight into the places people visit around the holidays and the best times to get on (or stay off) the road. To gain a better understanding of the places that people intend to visit throughout the holidays, we can analyze the number of times that people request directions to a location using Google Maps. 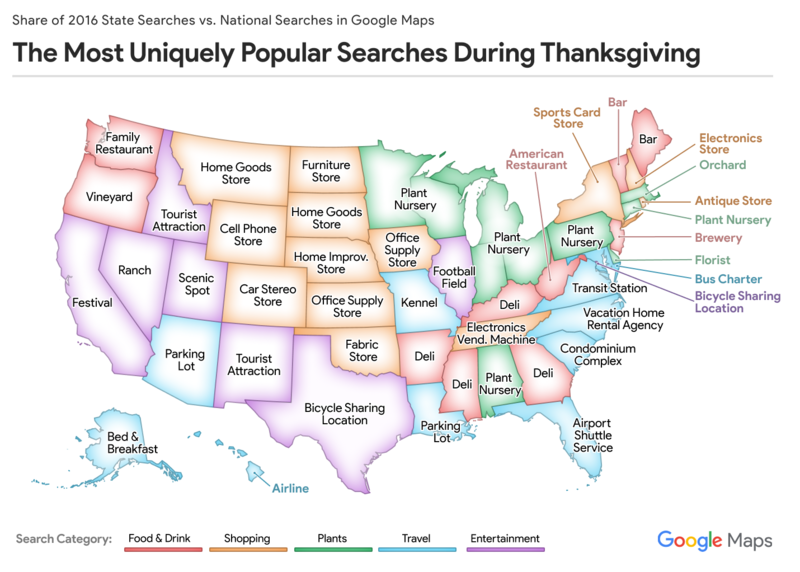 Nationally, the most commonly searched-for location during the Thanksgiving holiday is a department store. But the popularity of department stores isn’t unique to Thanksgiving – they’re pretty popular throughout the year. If instead we focus on locations that are searched during the holiday far more than normal, we find that ham shops are the most popular. Continuing this trend, we can find the most uniquely popular searches by state (Floridians are in need of Airport Shuttle Services) or city (people in Portland, Oregon are big fans of donuts). Keep reading to find the most uniquely popular searches in your area. Nationwide, these are the most uniquely popular stops during the Thanksgiving holiday. If you’re looking to get in on the fun but avoid the crowds, try to visit these locations when the search volume is low. In the U.S., few holidays can compete with Thanksgiving when it comes to food. While many families will enjoy a large meal on Thanksgiving, Americans still need help navigating to a variety of food and drink locations throughout the holiday period. Find out which types of food are most uniquely popular in your area on each day. There were no uniquely popular searches for this city and day. Try another selection. Whether you’re a football fan or just eagerly anticipating this season’s newest hit movies, Thanksgiving is also a time to enjoy entertainment. Find which types of entertainment venues and activities are most uniquely popular in your area on each day. The day after Thanksgiving, colloquially known as “Black Friday”, is one of the biggest shopping days of the year. Take a look at which types of shopping are most uniquely popular to your area. You may be used to your area’s traffic patterns during a typical week, but holiday travelers move on a different schedule. With typical traffic levels as a baseline, here is when you can expect traffic to be heavier than normal in your area. On a typical weekday, we can try to avoid traffic in our area by staying off the road during rush hour. But when is the rush during a holiday period? With everyone on their family’s unique schedule, it can be hard to pinpoint the best times to travel. 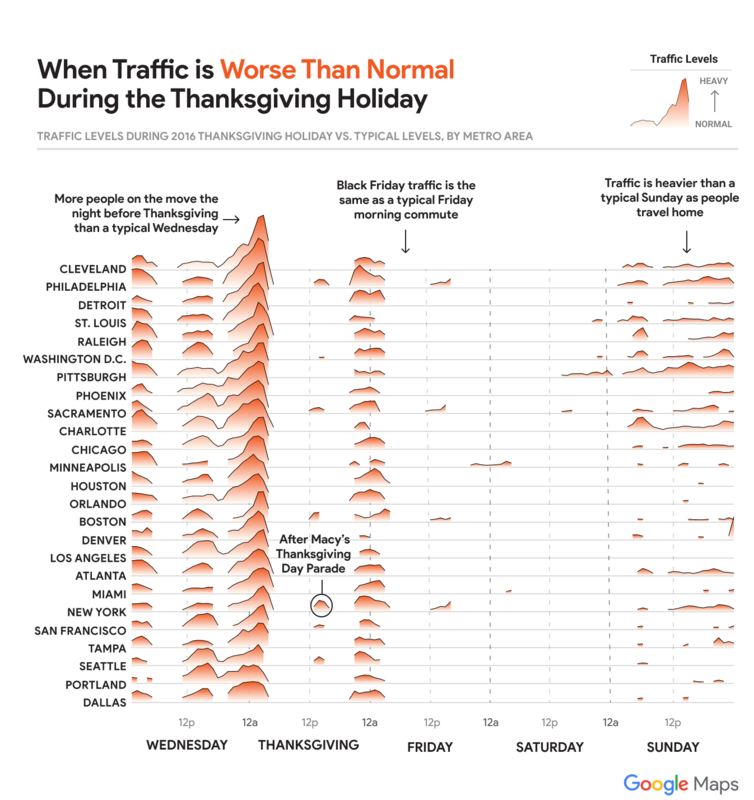 Here’s what we recommend based on last year’s Thanksgiving travel data. Whether you’re planning to see what all the buzz is about at New York’s bagel shops or you’re just trying to skip the gridlock, have a very Happy Thanksgiving. 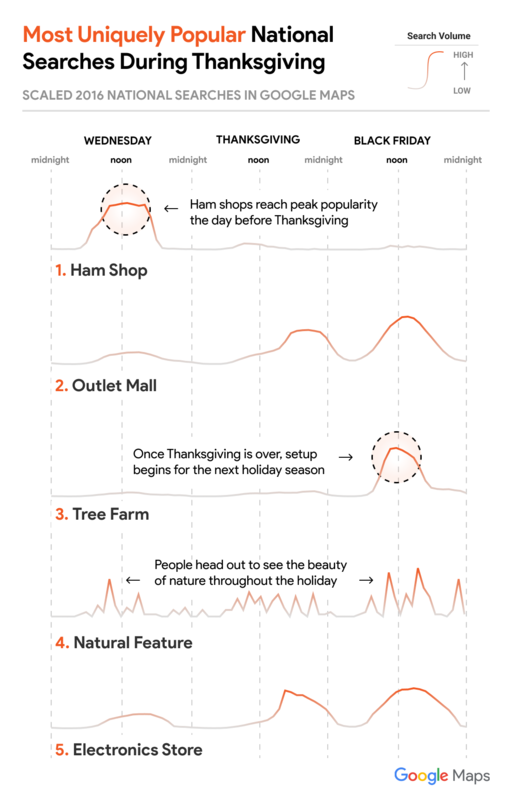 Mapping Thanksgiving is a collaboration between the Google News Lab, Google Maps, and Polygraph. 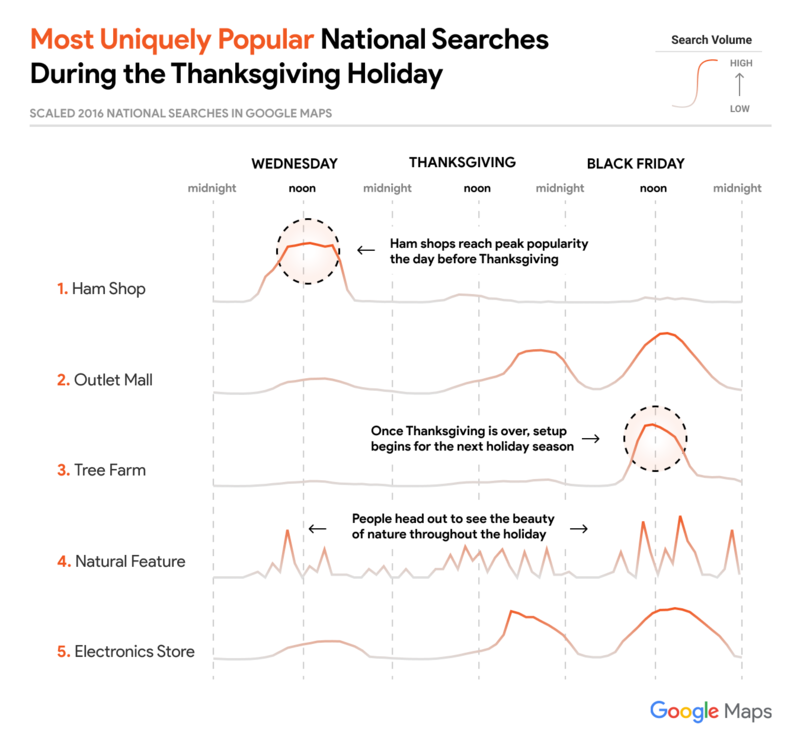 For search trends analysis, we considered the “Thanksgiving Holiday Period” to start the Wednesday before Thanksgiving and end on Black Friday. Search trends are represented as general categories instead of exact search terms. Trending categories are determined by comparing the total number of direction requests during the Thanksgiving Holiday Period to the total number of direction requests 2 weeks before and 2 weeks after Thanksgiving week. The categories with the highest ratio increase during Thanksgiving week are considered top trending categories. 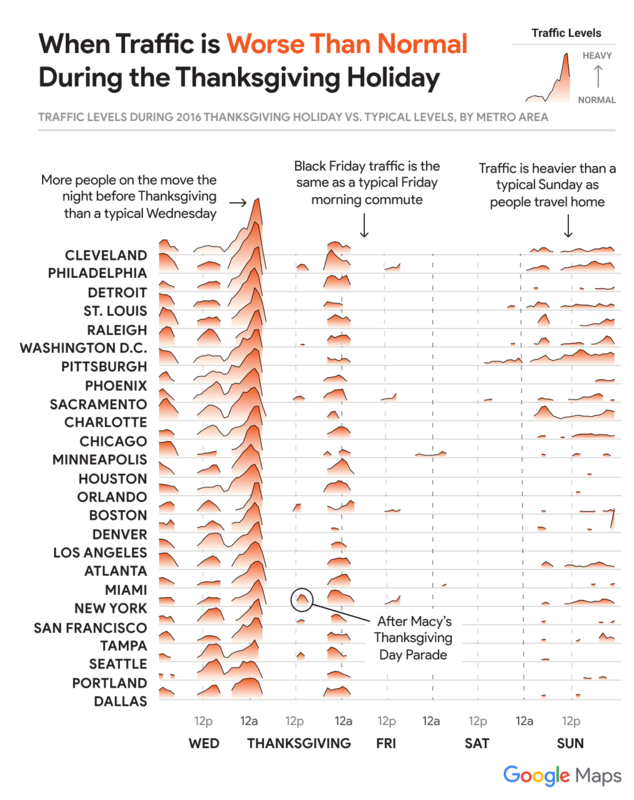 The trending categories in each metro were then compared to the ratio of trending national direction requests during Thanksgiving. Categories that were searched more frequently in a metro than nationally were considered “uniquely popular” in that metro. For determining traffic conditions, we considered the “Thanksgiving Holiday Period” to start the Wednesday before Thanksgiving and end the Sunday after Thanksgiving. We analyzed the total number of cars on the road at a given time, as determined by the speed and location of Android phones that have location services enabled. All traffic information is anonymous and taken in aggregate for 25 US cities and nationally.